Yan 燕 was one of the large regional states of the Zhou period 周 (11th cent.-221 BC). It was located in the northeast around modern Beijing. Its ruling dynasty was founded by Ji Shi 姬奭, the Duke of Shao 召公, a brother of King Wu 周武王, founder of the noble Zhou dynasty. The territory of Shao Gong Shi 召公奭 was in the beginning called "Northern Yan" (Beiyan 北燕) because there was another, quite smaller state called Yan (located near modern Jixian 汲縣, Hebei), whose family bore the name Ji 姞. The character for the state of the Duke of Shao was originally written 匽 or 郾, as can be seen in the inscriptions of excavated bronze vessels from the early Western Zhou period 西周 (11th cent.-770 BCE). The title of Duke of Shao was inherited to the descendants of Ji Shi, at least during the Western Zhou period. Map according to Tan Qixiang 谭其骧 (1987), Zhongguo lishi ditu ji 中国历史地图集. Yan was located in the northeast around modern Beijing. It exerted substantial pressure on the state of Qi on the Shandong Peninsula and was among the last states that fell victim to the expanding kingdom of Qin. In the north, Yan built defensive walls against raids of wild tribes. Those were presursors to the Great Wall of the Qin and Han period. Click to enlarge. When King Wu died and his young son King Cheng 周成王 mounted the throne, his uncle, the Duke of Zhou 周公, took over regency. The Duke of Shao was appointed Grand Guardian (taibao 太保) and was so also one of the highest ministers at the court of King Cheng. Yet the Duke of Shao criticized his brother with the argument that this form of regency was not correct. Only when the Duke of Zhou quoted several precedent cases from the past, the Duke of Shao was convinced that no usurpation took place. This dispute is narrated in the chapter Jun Shi 君奭 in the Classic Shangshu 尚書 "Book of Documents". While the Duke of Zhou was responsible for the eastern territories, the Duke of Shao supervised the western territories, which means that he barely visited his own state in the northeast. The capital of Yan was Ji 薊 (modern Beijing), during the reign of Marquis Huan 燕桓侯 (r. 698-691) Linyi 臨易 (near modern Xiongxian 雄縣, or Yixian 易縣, Hebei). Bronze vessels excavated in Liuliuhe 琉璃河 southwest of Beijing bore inscriptions with the name Ke 克, who was apparently a direct descendant of the first Duke of Shao. The chronicles of the state of Yan for the first nine generations after the death of the Duke of Shao have not survived. All the more, the personal names of most rulers of Yan are also not known, and the chronicles do not report much until the Warring States period 戰國 (5th cent.-221 BCE). Yan seems to have been a quiet place during the Western Zhou and Spring and Autumn 春秋 (770-5th cent. BCE) periods. Under the rule of Duke Zhuang 燕莊公 (r. 690-658), Yan took part in the war of the regional rulers (zhuhou 諸侯) against King Hui of Zhou 周惠王 (r. 676-652) and attacked, together with Song 宋 and Wei 衛, the royal capital Chengzhou 成周 (Luoyi 雒邑, modern Luoyang 洛陽, Henan). They exiled King Hui and enthroned his younger brother, Prince Tui 頹. Yet only a year later the ruler of the state of Zheng 鄭 arrested the commander of the armies of Yan, Yan Zhong Fu 燕仲父, and escorted King Hui back to Luoyang. In that year the "mountainous Rong tribes" 山戎 invaded the territory of Yan and could only be expelled with the support of troops of the hegemonial lord (ba 霸) Duke Huan 齊桓公 (r. 685-643) of the state of Qi 齊. Duke Huan of Qi pursued Duke Zhuang of Yan to offer his submission to King Hui, so that the balance between sovereign and regional ruler was tared again. Duke Zhuang was the first ruler of Yan who officially adopted the title of duke (gong 公), which was actually reserved to functionaries in the central government. Before, the official title had been hou 侯 "marquis", i.e. local governor. Duke Hui 燕惠公 (544-536) had a minion called Song 宋, whom he wanted to become chief minister, while all the noble grand masters (dafu 大夫) were to be eliminated. Yet the nobles rebelled, killed Song and forced Duke Hui into exile in Qi. With the help of Qi and Jin 晉, the Duke was able to return to his territory, but he died soon. Under the rule of Duke Wen 燕文公 (r. 361-333), the coalition advisor Su Qin 蘇秦 was given an audience and suggested creating an alliance with the state of Zhao 趙 in the west. Duke Wen's successor is posthumously known as King Yi 燕易王 (r. 332-321). Just when he had mounted the throne—still as a duke—the state of Qi used the funeral period to attack Yan, and seized ten villages. In 323, the duke adopted the title of king (wang 王). Su Qin had a secret affair with one of the wives of late Duke Wen and feared that the affair might be discovered. He therefore pursued King Yi to send him to Qi, where he would intrigue so that Yan would become a stronger state. The King consented and sent Su Qin to Qi, where he was immediately used as an advisor. Yet a few years later, Su Qin was killed, without having achieved his political aim. King Yi was succeeded by his son Prince Kuai 噲 (r. 320-312), who was not given a posthumous temple name. The counsellor-in-chief of King Kuai was Zizhi 子之, who was befriended with Su Dai 蘇代, a brother of Su Qin. Su Dai, sent out by the king of Qi to the court of Yan, pursued King Kuai to hold his chief minister in high esteem. The "hidden worthy" Lu Maoshou 鹿毛壽 thereupon suggested to the king offering Zizhi the throne, just like the mythical emperor Yao 堯 had offered Shun 舜 the rule over his empire instead of enthroning his own son. The intention behind this proposal was that Zizhi, as a honest person, would of course refuse the throne, and thereafter be all the more loyal and trustworthy. Yet this plan did not work, so that in the end, Zizhi was made regent and was the factual ruler, while the senescent King Kuai was totally dependent of him. When Zizhi had reigned for three years, Prince Ping 平 and Shi Bei 市被 rose in rebellion. The nobles of Yan thereupon asked King Min of Qi 齊湣王 (r. 323-284) for help. The nobles had an army assembled to attack the palace of Zizhi, yet without success, so that their troops turned against the mansion of the heir apparent Prince Ping, who had conspired with the king of Qi. At that time the king of Qi was advised by the Confucian philosopher Mengzi 孟子, who saw a chance for the king of Qi to conquer the state of Yan. The nobles of Yan and their troops offered no resistance at all, and King Kuai died during the fights. Zizhi was captured by the troops of Qi and was cruelly executed. The neighbouring state of Zhongshan 中山 used the turmoils to occupy part of the territory of Yan, and the troops of Qi did not show a sign of willingness to withdraw after the internal quarrels in Yan were ended. In 312 therefore, the allied states of Qin 秦, Wei 魏 and Han 韓 attacked the army of Qi and defeated the invader at Pushui 濮水. King Wuling of Zhao 趙武靈王 (r. 326-299) protected Prince Ping and ensured his enthronement as king of Yan. He is known as King Zhao 燕昭王 (r. 311-279). It was King Zhao's duty to rebuilt the state of Yan and to assemble competent ministers at his court. Guo Wei 郭隗 supported the king and was able to attract numerous intelligent advisors, like Yue Yi 樂毅 from Wei, Zou Yan 鄒衍 from Qi, or Ju Xin 劇辛 from Zhao. He established two capitals, Ji, and a secondary seat at Wuyang 武陽 (near modern Yixian, Hebei), and probably also a third seat. Thirty years later Yan was a prosperous and strong country. General Qin Kai 秦開 defeated the Eastern Hu 東胡 tribes and expanded the territory of Yan towards the northeast. In 284, King Zhao joined the alliance with Qin, Chu 楚, Han, Zhao, and Wei and attacked the state of Qi. The army of Yan invaded and looted Linzi 臨淄, the capital of Qi, and forced King Min of Qi into exile. Barring a few cities (Shengliao 剩聊, Ju 莒, and Jimo 即墨), Yan occupied the whole territory of Qi. King Zhao was succeeded by his son, who is known as King Hui 燕惠王 (r. 278-272). King Hui replaced Yue Yi with Qi Jie 騎劫 as highest commander of the army, yet Qi Que was not a good leader, and Yan lost all the territory of Qi again. When King Hui died, the states of Han, Wei and Chu joined into an alliance whose troops attacked Yan. The state of Qi had recovered under a new dynasty. The army of King Hui's successor, King Wucheng 燕武成王 (r. 271-258), lost battle against the troops of Qi under Tian Dan 田單. King Wucheng was succeeded by his son, King Xiao 燕孝王 (r. 257-255), who died soon. His successor and last ruler of Yan was King Xiao's son Prince Xi 喜 (r. 254-222). In 251, King Xi sent out his counsellor Li Fu 栗腹 to conclude an alliance with the state of Zhao in the west. Li Fu critically observed the situation of that state and discovered that the largest part of the army of Zhao had been massacred by Qin in the battle of Changping 長平, so that practically only infant males were left in Zhao. This could be a chance to seize the territory of Zhao, yet Yue Jian 樂間 warned King Xi against such a campaign because on all sides, Zhao was surrounded by militarily powerful states, and should therefore be used as a buffer between Yan and Qin. The king did not consent and dispatched two large armies, one commanded by Li Fu, and one by Qing Qin 卿秦 (or Qing Qin 慶秦). The last person warning the king was Jiang Qu 將渠, who argued that it was not appropriate to first conclude an alliance and then attack the strategic partner. King Xi refused this advice, kicked Jiang Qu away and took over command over the rearguard himself. When the army of Yan arrived at the border, the king of Zhao ordered Lian Po 廉頗 to assemble the forces of Zhao. He crushed the division of Li Fu at Haodi 鄗地, while the forces of Qing Qin were defeated by Yue Cheng 樂乘 near Dai 代. Lian Po's division pursued the enemy and was even able to besiege the capital of Yan in Ji. The king asked for peace, but Lian Po was only willing to accept submission if Jiang Qu would be the negotiator. Jiang Qu was thereupon appointed counsellor-in-chief and concluded peace with Zhao. In 243, the Zhao general Li Mu 李牧 occupied two towns of Yan. Yet the state of Zhao was not to survive for very long. Part of it was conquered by Qin and transformed into a commandery (jun 郡) of Qin. Even in this situation, Zhao still attacked the territory of Yan and seized some towns. The king of Yan, on his side, entrusted Bi Xin with a division to fight against general Pang Nuan 龐煖 of Zhao. Although Pang Nuan had formerly been a friend of Bi Xin, he utterly destroyed the army of Yan and killed its commander. In 236, Zhao occupied two further towns of Yan. The state of Qin used the permanent military engagement of Zhao toward the east to attack its rear from the west. In 228, the state of Zhao was conquered and became part of the state of Qin. 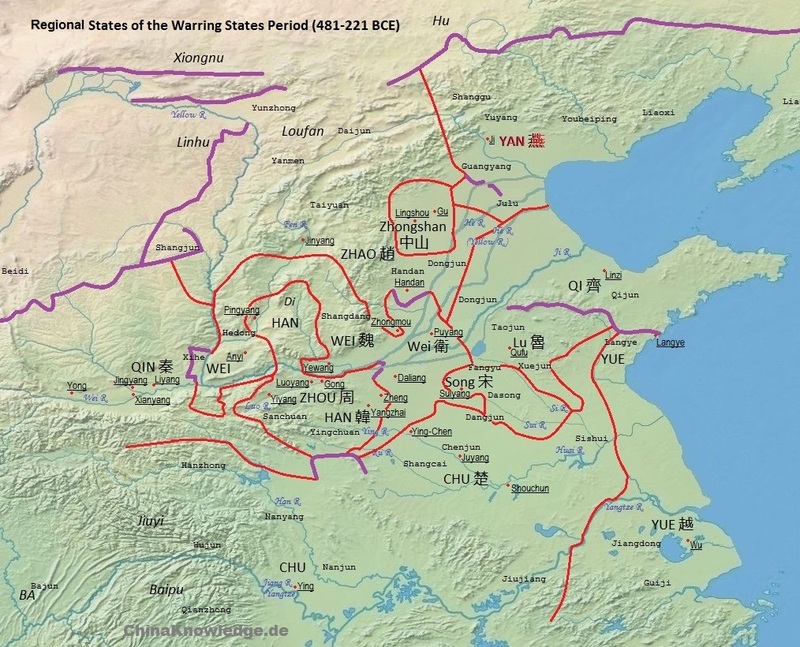 Yan had therefore become a direct neighbour to Qin, which was ever more perceived as a danger for the old system of regional states of the Zhou period. In 232, the heir apparent of Yan, Prince Dan 丹, who had been dwelling in Qin as a political hostage, had been able to escape. He raised twenty fearless men and sent out Jing Ke 荊軻, one of his retainers, to Qin, under the pretext to present a map of the territory of Dukang 督亢 that should be offered to Qin against peace. In the map, a dagger was hidden, with which Jing Ke planned to kill the king of Qin. This story is narrated in the novella Yandanzi 燕丹子. The assassination attempt failed and proved to be an ideal pretext for Qin to dispatch an army under Wang Jian 王剪 to attack Yan. Wang Jian advanced to the capital of Yan, yet King Xi was able to flee to Liaodong 遼東, where he beheaded Prince Dan and sent his head to the king of Qin, in order to appease the conqueror. Yet in 222, the troops of Wang Ben 王賁 captured the king of Yan and integrated his territory into the empire of Qin. The name Yan was often used for imperial princedoms, and for five of the Non-Chinese Sixteen States (Shiliuguo 十六國) of the north during the time of south-north division. The name of the ancient regional state is also used in a traditional name of Beijing, namely Yanjing 燕京. Shiji 史記, 44, Yan Shaogong shijia 燕召公世家. Li Ling 李零 (1992). "Yan 燕", in Zhongguo da baike quanshu 中國大百科全書, Zhongguo lishi 中國歷史 (Beijing/Shanghai: Zhongguo da baike quanshu chubanshe), Vol. 3, 1356-1357.